I like how Hazel Soan has depict subjects with just a few strokes and some blending of colours. Those human figures on the cover were just painted with a few colours. That's what I'm talking about. So I bought the book hoping to find out how she does it. 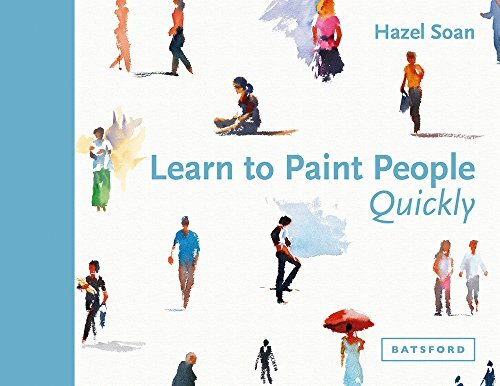 This book features tips on how she paints figures. Most are actually observational tips, things that you might have observed yourself, except they are put into words in this book. There are numerous examples with captions that talk about the things you should look out for when painting. This would be things like proportion, poses, lighting, clothing, context and portraits. There are only 112 pages in this A5-sized hardcover book. Each tip is perhaps a paragraph long. There are many tips but you can finish this book under an hour. Of course the best way to use this book is to use it as a reference, when painting your own figures, think about the concepts that are discussed in the book. There are only 4 step by step tutorials and they are rather brief. The book would be much more useful with a few in-depth tutorials or more exercises. Another thing I found missing or not emphasised is the importance of getting the silhouette right. When you get the silhouette right, even without colour, you will still be able to recognise the human figure or pose. Overall, the tips are helpful, but more information can definitely be added. If you want to learn more about drawing human figures, I recommend you check out Lynne Chapman's Sketching People: An Urban Sketcher's Manual to Drawing Figures and Faces. There are even more tips and techniques covered.